It’s been 3 years since I made that life changing trip to the ER. This was something that especially stood out to me as I stared at the clown fish mural on the wall of one of the pediatric emergency room bays recently. I remember staring at that same cartoon sea creature painting 3 years ago when I was receiving some painful, devastating news. “Dad…this is THE room”, I pointed out to him as we both blinked our bleary eyes. However, that memory is not the only thing coming up on an anniversary. On a more exciting and cheerful note, the 4Nathalie Tie Dye Event is about to take place this weekend, Saturday May 2nd! After a pretty crushing blow that turned out to be cancer, there wasn’t a whole lot that could really and truly cheer me up. I didn’t know that such a fun and light hearted event could be possible, but the first 4Nathalie tie-dye held in a garage was exactly that! An undeniable feeling of hope was in the air that I couldn’t ignore. But this year, I’m really HOPING that the tie dye can be more than just an incredibly fun event, though. This year it means a little more. Being diagnosed with cancer is never, ever, an easy process. But the thing that pushed the dial from ‘hard’ to ‘devastating’ for my family was the specific type of cancer diagnosis. I pretty much always end up explaining ASPS as 1% of sarcomas, which occur 1% of the time in all cancers. To say that it’s rare is kind of an understatement. After clarifying that the biopsy matched ASPS, our old oncologist proceeded to list all the different cancer treatments in existence, then explained why each and every one of them didn’t work for my cancer until we were left with none. It was a tough appointment, but after the initial feeling of helplessness, my mom and dad started researching every possibility under the sun. I couldn’t be more grateful that they did that, because they’re the reason I’m even having a 3 year anniversary. However, the tough truth is that there really isn’t much for ASPS, whether it’s in terms of funding, research, or treatments. Because ASPS is so rare, there isn’t a clear survival rate percentage. Some people get lucky, and some…don’t. Even though I’m pretty biased, I believe that just because something’s rare doesn’t mean it doesn’t deserve attention. Focusing on all different types of cancers will only just get us one step closer to curing it overall. Back when I was first given my diagnosis, my family connected online with another girl 2 years older than me in Seattle who also had ASPS. Even though we never got to meet each other in person, we both felt almost like sisters, sharing a bond as we went through the roller coaster that is ASPS together. From what I knew about her, she sounded like a girl I’d aspire to be. She fought courageously for 7 YEARS, always with a beautiful smile, positive outlook, and a heart filled with faith for the Lord. Unfortunately, she went to join him too early in April last year. It wasn’t because she didn’t have enough strength or hope. It was because there weren’t enough effective options available for her at the time. I don’t like the phrase “lost their battle” when talking about fighting cancer because it implies that the situation was in their control, which it obviously isn’t for so many. Karina is still really hard for me to talk about, because I find myself questioning why certain things happen and why they’re so unfair. 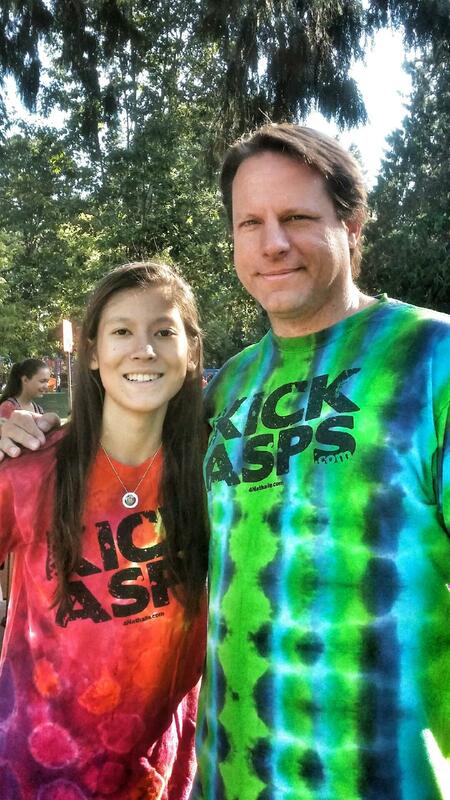 However, she has inspired me to work as hard as I can to raise both awareness and funding for ASPS. She’s the definition of a fighter, and in her honor I’d like to try and make stories like hers more and more scarce. I can only hope that sharing her story and mine will in turn inspire anyone reading this to be more passionate about finding solutions for ASPS. Like my dad has mentioned, we’ve finally found something promising to get behind. Dr, Kevin Jones is leading an ASPS targeted study, but it won’t happen without a little help. We’re planning to send the proceeds from the tie dye event his way. As much as I love interacting with people in person, not everyone can make it to the event. And that’s okay, because if you’re interested in lending a hand to us, a friend is hard at work setting up a donation page on the 4Nathalie website. I’m really excited for this weekend. Tie dye can do more than you think.